Question: I am trying to learn the double haul and not having much success. Part of the problem is that I can’t seem to get the timing right. Any tips? Answer: There are plenty of great resources to help you learn the double haul, including Tom Rosenbauer’s article and Joan Wulff’s video right here on Midcurrent. But even if you understand the concept and the mechanics behind double-hauling, teaching yourself to do it can be difficult because you can’t watch yourself while you cast to see what you’re doing right or doing wrong. The best solution I’ve seen for curing this problem comes from Macauley Lord, and I’ve used his method to teach several people to double haul. When I explain the process, the usual response is, “Why didn’t I think of that?” In my experience, this is the fastest way to learn to double haul, and I’ve had students who could virtually double their distance after a half hour of practice. So what’s the big secret? Cast sidearm, so the rod and line move parallel to the ground. This allows you to watch the whole process: the loading of the rod, the timing of the haul, and the way your line speed increases when you do it right. When you can actually see the mechanics of the double haul, you can more quickly perfect it. 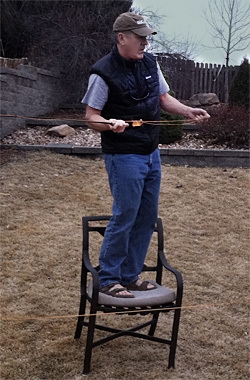 To do this well—and to avoid your line hitting the ground—you’ll need to be casting from a raised position and be casting over a flat surface, whether it’s your lawn or a parking lot. You can simply stand on a chair or a wall of some kind, anyplace that will allow you to cast sidearm comfortably and not worry about the line. I have a short, steep hill in my yard that works perfectly. A couple years ago, my friend Eric was saying that he wanted to learn the double haul, so I put him on the side of the hill, had him lay his cast to the side, and just told him to start casting. He was amazed that he could actually see the effects on the haul on both his rod tip and the line, and he was able to dial-in the timing in about ten minutes. So read Tom’s article and watch Joan’s video to learn the actual hauling motion, and then go outside, turn the cast on its side, and learn the timing. You’ll be heaving a longer line in no time. And once you’ve got everything working to your satisfaction, start trying the cast overhead as you normally would.